If you're breastfeeding and you drink milk or eat cheese, ice cream, or yogurt, can it cause sensitivities and allergic reactions in your baby? Well, much of the food that you eat does travel into your breast milk. And, while most babies will never have a sensitivity or reaction to any of the foods in their mother's diet, some will. When a child does have a reaction to something in breast milk, the likely culprit is cow's milk. Is a Cow's Milk Allergy the Same as Lactose Intolerance? A baby with an allergy to cow's milk is reacting to the protein in cow's milk. It's not the same as lactose intolerance. Lactose is sugar and not a protein. It's very unusual for a newborn or a young child to have an issue with lactose. Lactose intolerance is typically seen in adults or older children. The most common symptoms of a cow's milk sensitivity are stomach related. The protein in the cow's milk can cause gas in your baby's stomach and intestines, which can lead to pain, vomiting, or diarrhea. A food allergy could also cause reflux, symptoms of colic, a rash or hives, and bloody poop. It could make your baby irritable or fussy, and he may cry a lot. If your child is in pain or has any of these symptoms, call the doctor. Since many of these symptoms are also caused by other conditions, try to be as detailed as possible when you're describing what's going on with your baby. The more information the doctor has, the easier it will be for him to narrow down the cause of the symptoms so that together you can start creating a plan to make things better. 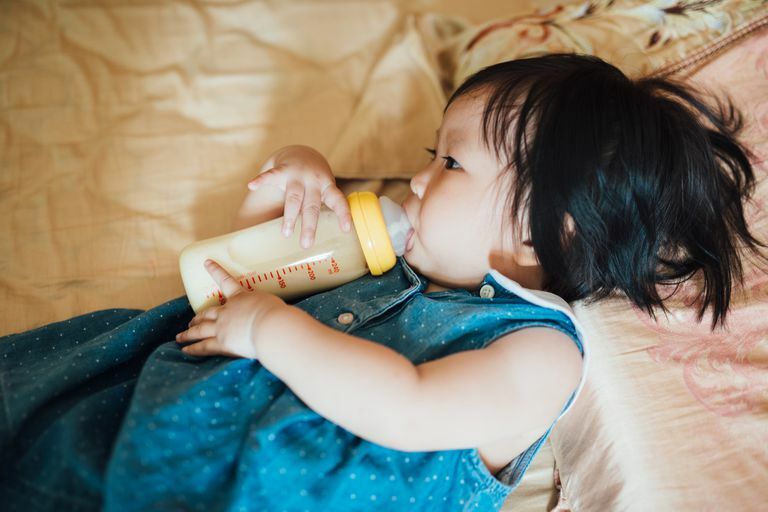 Can You Still Breastfeed If Your Child Is Sensitive to Cow's Milk? You don't have to stop breastfeeding because of a suspected sensitivity to cow's milk protein in your baby. If the symptoms aren't too bad, you can try to stop drinking cow's milk. But, if the symptoms are severe, your doctor may recommend that you don't eat or drink anything that has cow's milk in it at all. There is no doubt that it will be hard at first, but you can do it. And, once you get started, you may see things begin to improve in as little as a few days. Of course, it can take up to two weeks to really see results, so try to be patient and keep your mind on the goal. If, after two weeks of dairy-free, you do not see any difference and your child is still showing signs of an allergy, then dairy is probably not the cause of your baby's issues. But if you do see improvement and it seems milk is the cause, then you should do your best to stay on the milk-free diet. Do You Have to Avoid Milk Products When You're Breastfeeding? You don't necessarily have to stay away from dairy for as long as you decide to breastfeed. If your baby has a sensitivity to cow's milk, once you've eliminated all the dairy and your child is feeling better, you can wait a while to then slowly start to reintroduce some dairy products back into your diet. If your baby starts to react, you can stop the dairy once again. Keep trying every few weeks or so, and as your baby gets older, he may be able to tolerate it more and more. Food allergies are less common, but they can be more serious. So, if your child has had a severe reaction to the cow's milk protein, you have to be much more careful. Discuss the reintroduction of cow's milk into your diet with your child's doctor. You may have to remain dairy-free until you wean your child, or you may be able to reintroduce dairy under the doctor's direct supervision. While you're limiting your diet to dairy-free, you don't have to suffer completely. There are some fantastic substitutes for cow's milk and milk products available for you to try. You can use soy milk, rice milk, coconut milk, and almond milk in place of regular milk. You can drink them by the glass, or add them to your coffee or cereal. They're even available in chocolate flavor. You can also enjoy dairy-free yogurt and ice cream or have some Italian ice instead of traditional ice cream. Just look for dairy-free on the labels at the grocery store, and you'll be doing fine. Of course, like everything else, use these milk substitutes in moderation. Even a good thing can become a bad thing if you have too much of it. And keep in mind that even though a reaction to cow's milk is the more common one, soy and nuts can also cause allergies. You may be surprised to find that you like some of the dairy-free options better than cow's milk. You may even feel better and more healthy once you become dairy-free. But remember that milk can be found in so many different products, including soups, salad dressing, and baked goods, so you have to be a detective and stay vigilant in the supermarket until you get used to your new shopping situation. If your baby breastfeeds and takes formula, a cow's milk-based formula can cause the same milk allergy symptoms as breast milk that contains cow's milk protein. It may even be worse. You should talk to your child's health care provider about changing your baby's formula. Soy formula is an option, but it can also cause allergies in some infants who are allergic to the cow's milk protein. A hypoallergenic formula may be the way to go. What If You Want to Give up on Breastfeeding? The longer you can continue to breastfeed your baby, the better it is. However, it can be incredibly exhausting and difficult to care for a child who always cries and appears to be in pain all the time, especially if you don't have much support. Talk to your partner, your doctor, and your baby's doctor to get all the information you need to make the best choice you can for you, your child, and your family. Sometimes giving up on breastfeeding is what you need to do. And, if after a period of healing, you decide to try breastfeeding again, you certainly can. Greer FR, Sicherer SH, Burks AW. Effects of early nutritional interventions on the development of atopic disease in infants and children: the role of maternal dietary restriction, breastfeeding, timing of introduction of complementary foods, and hydrolyzed formulas. Pediatrics. 2008. Jan 1;121(1):183-91. Hill DJ, Roy N, Heine RG, Hosking CS, Francis DE, Brown J, Speirs B, Sadowsky J, Carlin JB. Effect of a low-allergen maternal diet on colic among breastfed infants: a randomized, controlled trial. Pediatrics. 2005 Nov 1;116(5):e709-15. Protocol AB. ABM clinical protocol# 24: allergic proctocolitis in the exclusively breastfed infant. Breastfeeding Medicine. 2011;6(6).